Words allow us to enter into new worlds. They allow us to inhabit new spaces, evoke new feelings, receive different ideas and come to the see the world differently. They also allow us to experiment with the creation of those same things. The opposite is also true, familiar words can permit us to reinforce boundaries that separate what is experienced as ‘me’ and ‘other’ and build and sustain allegiances, whilst creating distance from all manner of forms and possibilities. Language is a network of possibilities and worlds. We have what is called an idiolect, which is our own personal dialect, made up of specific chunks of language, favourite words, and phrases that we use again and again and that stimulate certain feelings and posturing whilst formulating and stabilising our own subjective realm of being and the ground on which we build our ideas and beliefs. Groups have their own dialects too. We usually learn this when we go to university and find a whole lot of specialist terminology to memorize and then use appropriately in order to be able to inhabit a new world of ideas successfully, and importantly, reproduce it. The same is true of religions. In Buddhism new followers of the different traditions begin to learn the lingo and in doing so reproduce the dialect, and therefore the ideas and beliefs, of the group. If they choose to become integral members, they assimilate into the group in great part through the reproduction of the group’s language, which forms a significant part of the glue that binds the members into a shared sense of meaning and perspectives. Such actions have the potential to entrap as much as free and sometimes the line between the two is difficult to perceive. The more educated, intelligent reader will likely be all too aware of the power of language and the close knit relationship between a basic understanding of language and the ability to think for one’s self, as well as enter into the thinking, ideas and discoveries of our great historical thinkers, writers and innovators. Words matter. One of the ideas that is central to a post-traditional approach to Buddhism is to examine and reconsider the language that we use when discussing Buddhism. This has two facets. The first is to find our own voice and to use our own words to capture and describe accurately our own experience, thoughts and opinions: where those words are missing, to find other linguistic forms to use through an expansion of the network of ideas that we have at our disposal. The second is to find a way to talk about Buddhism, and experience within and of Buddhism, without relying on the dialects that fill dharma halls. To do so is to challenge assumptions, unpack beliefs and liberate the potential of Buddhist ideas and practices to come into dialogue with the wider world of human experience and knowledge. This is a key theme that runs through much of my writing and this concept runs counter to many of its more conservative and insular expressions and their claims to absolute authority, with Tibetan Buddhism being a ripe example. To do this, attention to language is key. The choice of words we use is important and an understanding of the relationship between loaded terminology and the uncritical reproduction of ideas is doubly important. Why? Because when a person reproduces such loaded terminology uncritically, it typically leads to the creation of a new self, the blind acceptance of artificial beliefs and the parroting of those ideas, language and behaviour. This is essentially what occurs in any form of committed social alignment of course. Such language in Buddhist circles consists of a great deal of Buddhist buzz words, such a karma, dharma, Buddha and so forth. For quite some time I have been bothered by the overuse of certain English terms in Buddhist environments: ego being one of them. In the way that it is used, I think it would be quite fair to label it under buddheme. In Buddhist circles, I have heard the word ego used to describe all manner of ills and painted as a bogey man, often becoming the imagined source of all our sins. Although ego can imply an exaggerated sense of one’s own importance, and arrogance too, it is a term that gained real usage in western culture due to Sigmund Freud, who understood it to be a factor of our psychic make-up that allows us to manage the extremes of our selfing process. The ego for Freud was the healthiest part of the human psyche and essential to our ability to participate functionally in the world. Nowadays, amongst Buddhists, it often gets used interchangeably with the self, which is unfortunate. It is funny how such a concept has gotten turned into a big bad wolf that doesn’t exist, but is somehow responsible for our suffering and naughty ways and vilified as a sort of collective enemy to be shunned. Although most modern dictionaries will include a definition of the ego as the self, a quick concordance search shows that its actual usage in society is predominantly negative and overwhelmingly associated with arrogance. Its mention in texts is predominantly found in the fields of psychoanalysis and psychology where it is discussed in Freudian terms. Confusing such a negatively connoted word with the self creates all sorts of unhealthy ideas regarding the goal of Buddhisms, as many of the first generation American Buddhists discovered when paying large fees to psychotherapists to help them deal with spiritual bypassing and all manner of suppression. A second word that has popped up in the netosphere recently as something to be shunned is authenticity. The rather nice Vincent Horn of Buddhist Geeks along with Kenneth Folk asked on Twitter, in response to a tweet of mine, ‘What does it mean to be authentic? Authentic to what?’ The word authentic is interesting because it seems to point to a conceptual break between different schools of thought in Buddhism and a wider issue concerning personal and/or spiritual growth. Firstly, the word authentic seems to bother folks who are taking a stand against notions of permanence, a true self, and a soul, which may in part be a reaction against neo-advaita and the sometimes misconstrued concept of Buddha-Nature. It also seems to be a push back against the idea that authenticity is fixed and that the true self must be found and restored to its rightful place at the centre of the world, due to a subject-object relationship in which a splitting of the false self from the true self has occurred and a merging of sorts must take place. This refutation of a true self fits in with most Buddhist doctrine, but it is a very much partial view of the human condition. In my view, the role of authenticity has little to do with metaphysical claims and has much more to do with the ethics branch of western philosophy, which is to say, the question of how to live a successful and responsible life. The German philosopher Hegel is interesting in great part because of the effort he put into understanding the nature of thought and of reason. Of particular note is his insight into thought as process, as an achievement that is accomplished through effort, rather than the acquisition of a pre-packaged formula. The most famous expression of this is his dialectic: the understanding that the maturation of understanding most frequently comes about through working with oppositions and seeming contradictions. He understood that often apparent contradiction does not require the elimination of one of the opposing sides, but an appreciation of their situatedness and resolution through the finding of a third way, or in his terms, synthesis, which is the movement to a higher, or more complete understanding. The inability to take into consideration this possibility of thought is often compounded by allegiance to others’ ideas uncritically. Hegel spoke of things containing their opposite which implies that understanding their co-dependence is more useful than simply denying or forcing the superiority, or destruction of one or the other positions. “Sometimes what appears to be a contradiction is the result of not specifying the respect in which statements are being asserted.” Michael Allen Fox, writing on Hegel. If there is no true self, soul, real me inside somewhere, what does it then mean to be authentic? Let’s look at the word. In existentialism authenticity has centre place in a life well lived. For existentialists to be authentic is to be true to one’s character and to avoid being caught up in the push and pull of external pressures to conform. This has much to do with alignment and the way we choose to relate to the shifting world around us. Although ultimately there is no fixed self inside, we do have a complex inner landscape of shifting forces, needs, desires to navigate that is at once personal and collective. We are multi-faceted beings with preferences, needs and drives. A well-lived life in society demands that we address these urges, needs and drives, which are often in conflict with the outer demands from society, family, colleagues and so on. At a basic level, to be authentic is to speak the truth to this meshwork of inter-being. The term authenticity conjures up, for me at least, a number of positive associations: genuine, transparent, honest, clear, and real, which are all qualities to be admired with each representing a means for combating unthinking allegiance and that form the basis of healthy, adult relationships. What’s also important is to realise that when we push away such a concept as authenticity, we are not only pushing aside its seeming flaws (its emptiness; or difficulty to grasp), but we are also excluding possible experience and a wider understanding of human nature. When we deny possibilities, for example with rigid ethical behaviour, we create ghettos of gated communities inside which we exclude possibilities whilst reinforcing others. So, if we deny the word ego or we reject the notion of authenticity, what are we losing in the process? Such certainty gifted by standing firmly on one side is problematic. I am going to make two suggestions regarding authenticity as a workable concept, even for Buddhists. I am going to point out firstly the obvious that authenticity must be impermanent, which is to say it is temporally and spatially located. Secondly, I am going to suggest that in relationships, authenticity has a fundamentally important role as an opposition to dishonesty, trickery, falseness and inconsistency. The result being is that to be authentic is a temporary, qualitative engagement with whatever is emergent and that we are also capable of making a clear distinction between authentic and inauthentic as two facets of a working basis for successful engagement in the world. Sure, authenticity is empty, if you stare into it, there’s nothing there. The same is true for all words though, and yet form remains. We need to honour form as much as we seek to understand and relate to the enigma of emptiness, or the vacuousness of things, and that means finding workable means for co-existing successfully in the world. An existentialist outlook begins with the recognition that there is no essential meaning to life therefore we are left to devise our own sense of what is important and more importantly choose how to live. For even if we can perceive this lack of essential meaning, we hopefully come to see that we are nonetheless inundated with prescribed meanings from the family, schooling and society we were born into. What do we choose to do with this meshwork of meanings that are so often absorbed unconsciously? One form of worldly freedom would be to dismantle this veil of prescriptive meaning and this implies finding our own way to the degree that we are able. 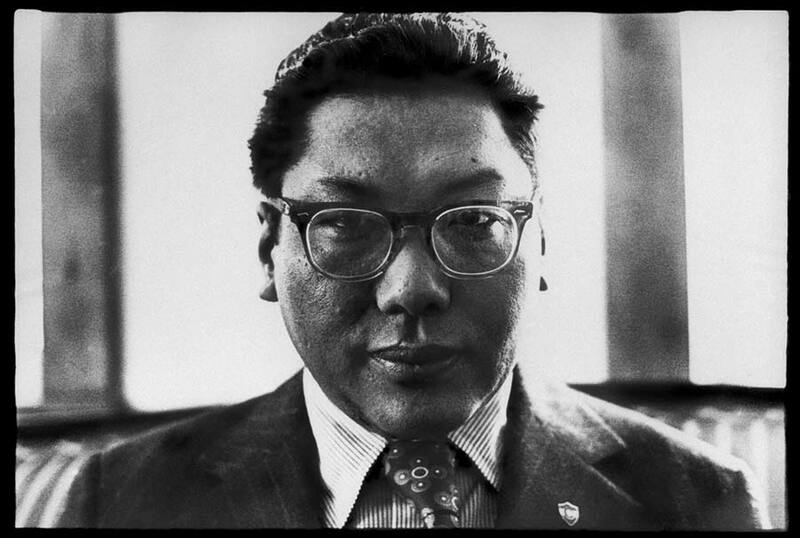 When it comes to an understanding of temporary, contextualised authenticity, Chogyam Trungpa has much to say. We can return to the issue of authenticity as emerging in part out of seemingly opposing views of the goal and desire of Buddhism; between the simplicity of renunciation in its broadest ideals, and the notion of engagement, or active participation in a flawed world, yet open with possibilities. This comes down to a shift from an almost passive reception of the world as it is, to a desire to answer the question, ‘How do I engage successfully with the world on its own terms?’ Trungpa attempted to address this question through his transmission of the Shamabhala way. In Shambhala, the sacred path of the warrior, Trungpa lays out the concept of authentic presence. In Trungpa’s understanding of authenticity we find an antidote to cowardice and contrived existence based on fitting in, following orders and reproducing the dominant ideological order, which you will note, resonates with the existentialist view. Authenticity becomes a quality of relating to the world. In shamanic terms this involves placing ourselves within our reference points (the world we predominantly inhabit and are accountable to) in what we can describe as a relationship of power. Power does not mean ‘power over’ here, but the ‘power to impact, effect change, cause events to occur, change, shift’. The degree to which we are willing to actively participate in what is immediate determines to a great deal the possibility we have of contributing to the world rather than standing by as passive observers. This theme runs through the dialectic of power and weakness, stability and change. Within the middle of dynamic force is presence, not simply as a quiet mind, but as force that acts on the world. To be authentic is to ride the waves of seeming chaos that mark much of our human existence and respond with the fullness of what we are, as we are, in each of the unfolding stages of our lives. Ponlop Rinpoche in a recent post on Mahamudra for the Shambhala Sun speaks of genuineness, interchangeable from authentic in this case, as a basis for practice. Authentic is wrapped up in being genuine, truthful, and transparent. These qualities of expression are intermeshed with the ongoing and fluid nature of being. It would be fair to say that being authentic is a modality of being that involves a commitment to these three qualities. In my experience, especially in leadership training, such qualities are all too rare at the various levels of society. Authenticity might imply vulnerability too Vincent suggested. But what is meant by such? If we consider how much of modern living demands we suppress or hide much of what we feel, think and would actually prefer to do, vulnerability might imply not just sensitivity, but the exposing of our intentions, desires and wishes, and the courage to engage with the world as it is, and as we are, as ongoing shifting movements of possibilities. In discussing authenticity, Trungpa speaks of exposing one’s heart to the world, but I think the whole idea of participation demands we expose all of what we are. To be authentic in this sense is to have the courage to show up when events occur and to bring our strengths and weaknesses along. It is not an entirely individualistic affair. When we expose ourselves to the world, we are always exposing a collective factor of being, bringing that into the light of day and this, funny enough, just happens to have the potential of eroding our sense of self as separate and fully unique. In a Hegelian sense, to expose the totality of what we experience ourselves to be is to come to recognise how we are collectively made and give expression to collective aspects of shared humanity. The choice is then to either embrace this fact as a self-affirmation, or use it to catalyse a dismantling of our attachment to ourselves and come to a higher view of the individual and collective, and their utter, yet not consuming, interdependence. Ghandi has this quote that I have always loved even though it seems to contradict Buddhist principles, “I want freedom for the full expression of my personality.” I do not see this as incompatible with the Buddhist insight of no-self, not-self and emptiness. It is more a recognition that life is in part theatre and that we emerge into this world with finite possibilities, with character dispositions, with personality traits, many of which are consistent, reflecting a small but significant degree of uniqueness that calls to be acted out. The most daring actors leave their mark on their audience by daring to give it their all, to burn bright under the spotlight, and at their peak, to channel something greater than they would otherwise be. There is a willingness to be a conduit for the birthing of new ideas, new behaviours, new practices that may shake worlds, big or small, or the restoring of some quality that has been lost. Authenticity is then a willingness to embrace our instincts, drives and folly regarding further possibilities of manifesting human possibilities, including freedoms and to go against the stream of conformism. In existentialism this is expressed through ‘individual freedom and having the courage to act…’ in spite of what is expected and demanded of you. The greats throughout history were often those who went down this path and this is no less true in the stories of the historical figures from Buddhism. The conformists are rarely celebrated. Only those who followed their own drives, who were authentic to their own passions, drives, need to know had the motivation to break through the status quo and give rise to a new perspective, a new path, and the catalyzation of an emerging shift.